Developed to reduce organic waste in barns, coups, stalls, manure piles/heaps, houses, kennels, cages, litter, bedding, drain sewers, municipalities, towns and cities, waste water treatment plants (land and cruise ship based) and reduces foul odors from lagoons and retention ponds. Bacillus and Pseudomonas bacterial blends to digest inanimate mass. These bacteria have the exceptional targeted enzyme production of lipase, protease, amylase, cellase, urease, pectinase, and chitinase, to speed the degradation and digestion of fats, carbohydrates, proteins, cellulose and starches. Formulated on a food-ready base accelerant to jump start the binary fission process. Available in 15 lb Bulk (Blue lid) & 30-8oz water soluble throw packs (Green Lid). Bio-Gel® MicroBlend G – Data Sheet. Bio-Gel® MicroBlend G BULK (color coded BLUE lid ) scoopable 15# dry powder (8-oz. scoop included). 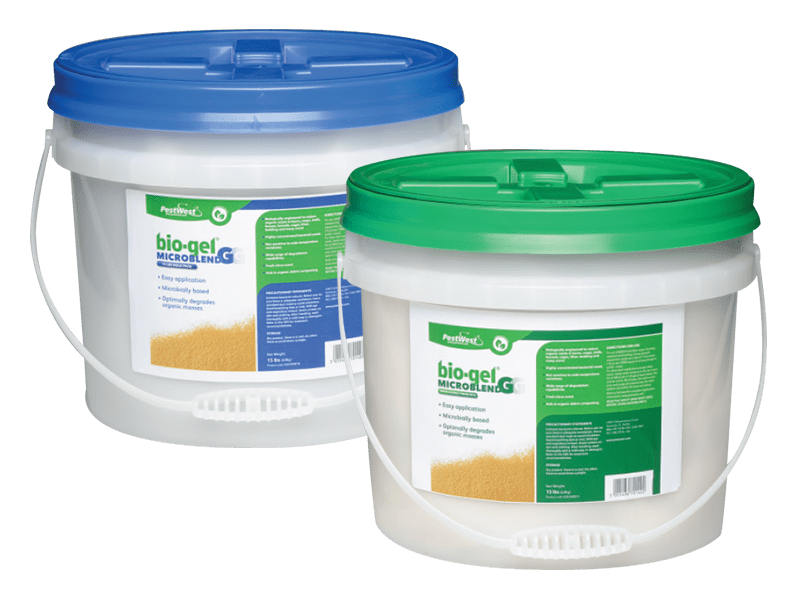 Bio-Gel® MicroBlend G BAC-PAK’s color coded (GREEN lid) is packaged in a water soluble 8-ounce active dry bacteria throw pack designed to consume inorganics to reduce odor and aid in degradation. Bio-Gel Micro-Blend G contains Bacillus and Pseudomonas bacterial blends that perform synergistically to digest inanimate organic mass. These bacteria have the exceptional targeted enzyme production of lipase, protease, amylase, cellase, urease, pectinase, and chitinase, to speed the degradation and digestion of fats, carbohydrates, proteins, cellulose and starches. Bio-Gel Micro-Blend G also is formulated on a food-ready base accelerant to jump start the binary fission process. BACPAK’s soft shell begins to dissolve in approx 1 minute. Please click HERE to download PestWest MicroBlend G PDF Leaflet.